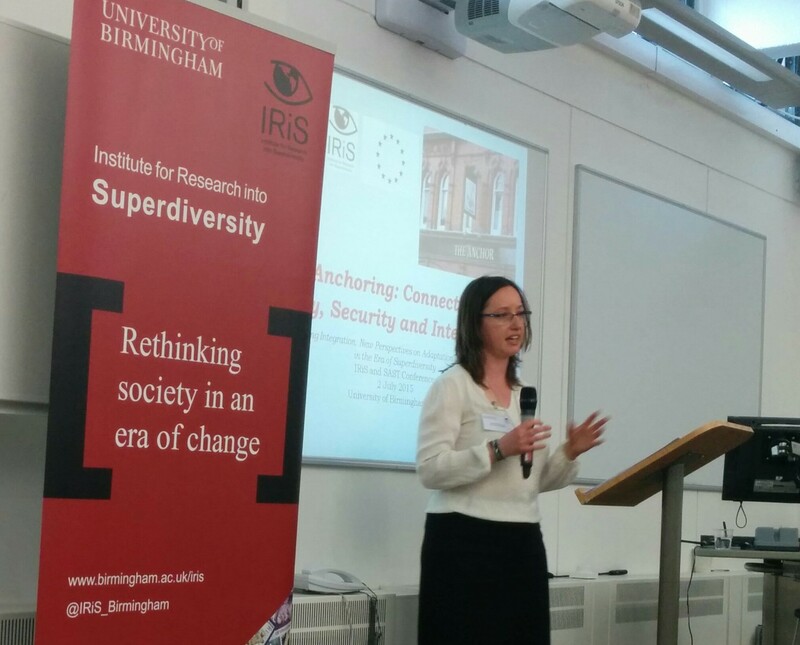 Last week saw 70 academics from across the globe come together for the second IRiS conference and, in a departure from what will become our usual format of an international biennial interdisciplinary conference, this day conference focused upon a single area of theory and policy: integration. The inspiration for the conference came from a number of projects that have been underway at IRiS in recent months. These include a Nuffield Foundation funded project which re-analysed the UK’s Survey of New Refugees focusing on the role of social networks in refugee integration , and Knowledge of Integration Governance (KING) an EU funded project examining the state of knowledge on migrant integration and Susanne Wessendorf’s Marie Curie funded project looking at new migrants pathways to settlement. Most importantly the conference provided a platform for dissemination of findings from Aleksandra Kazlowska’s Marie Curie Fellowship Project, Social Anchoring in Superdiverse Transnational Social Spaces. This conference came at an important time in Europe when much of the focus is on the so-called migrant crisis and on how to keep people outside rather than support resettlement. Where politicians and policymakers have talked about migrants within borders the onus has been on assimilation and the notion migrants should adopt a set of national values and beliefs around which there is no clear consensus. There has been no acknowledgement of the ongoing superdiversification in industrialised nations and no thinking about what that might mean for integration as a two or even three way process as Pennix has begun to suggest. So our conference theme: Rethinking integration: New perspectives on adaptation and settlement in an era of superdiversity was intended to provide a space within which scholars could come together from across disciplines to bring new insight into integration theory in this time of unprecedented change, mobility and population complexity. With over 30 speakers from wide-ranging disciplines including sociology, social policy, anthropology, political sciences and social-psychology, as well as think-tanks and NGOs, there were many insights on offer. In the morning plenary session Prof Louise Ryan (Middlesex) argued for need to dissolve the dichotomy between short-term and settling migrants showing how through a dynamic, ongoing negotiated process of embedding across a wide range of domains multiple trajectories were possible regardless of initial intentions of staying or leaving. Dr Alison Strang (Queen Margaret’s) pointed to a range of difficulties with the concept of integration including its contested and congested natures and the lack of attention given to the two way dimension raised by key commentators such as John Berry. Aleksandra Kazlowska’s (IRiS, Warsaw) plenary set out the absence of an identity perspective in contemporary integration theory and outlined a new theory, that of social anchoring, which she has developed to overcome the limitations of subjectively defined identity and to relate individuals to superdiverse and mobile societies. Throughout the conference alternatives to the concept of integration were proposed largely on the basis that integration had been contaminated by excessive politicisation in the past decade which led to it being equated with assimilation while the responsibility of the state to provide at least conditions for integration had been eroded. This was a theme picked up by the keynote speaker, Prof Stevan Hobfoll (Rush University, US) who used the analogy of baseball to argue that some flexible connections to mainstream culture must be extended to “immigrants” in order that they could share some common ground whilst maintaining their own culture. In a contribution that differed markedly from the largely Eurocentric and interpretivist discussions which dominated the majority of the day, Hobfall’s ideas, bringing a US and psychology perspective, were challenging and took many of us some considerable distance beyond our comfort zones. His statements about the majority population’s attitudes to immigrants and the sets of expectations associated with these attitudes combined with case studies from his work counselling traumatised migrant women described a stark reality in which the responsibility for integration became that of the migrant alone. He brought an entirely new perspective in beginning to apply his Conservation of Resources model to migrant settlement and sketching out the ways in which different dimensions of the model including the fitting of existing resources to new situations, necessity of adaptation for stress avoidance and inevitability of hidden barriers and denial of privilege has implications for migrant inclusion. With so many different contributions examining integration to discuss, the end of conference reception provided opportunity for lively debate. 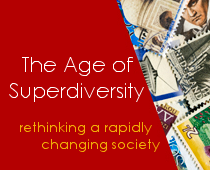 Next year we will run an international interdisciplinary conference (23rd and 24th June 2016) to once again bring new perspectives and provide an interdisciplinary space for superdiversity scholars to debate relevant theory, method, policy and practice. The Call for Papers will be widely circulated at the beginning of next academic year.